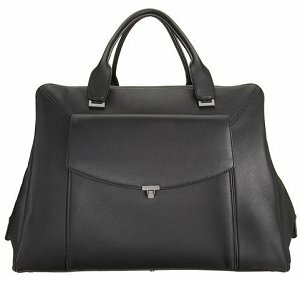 The Scott Lula's exterior is classic and refined, with smooth black leather and minimalist brushed silver hardware. I love its clean, contemporary lines, and that deep front pocket. The interior is spacious and lined with leather for extra opulence. Its long zipper extends conveniently down the bag's sides. This feature helps us easily pack and unpack our travel essentials. The generously sized interior is well appointed with a trio of gadget pockets, a secure zippered pouch, and a document wallet. This is removable, so you could use it as a clutch when you're stepping out and exploring your holiday hotspot. The straps are a disappointment though. They're sturdy and strong, but a shade too short for easy carrying. If you utilize all this space I imagine things will get awkward, especially if you've got a busy airport to navigate. The price is also a real drawback for all but Hollywood's A List. At $4000, us mere mortals might have to settle for a staycation or a trip to an interstate trailer park. You'll need to be a keen jetsetter to see value from this travel bag. The Bottega Veneta Brick Intrecciato weekend bag, a great alternative to this luxury travel bag.